Inbound marketing is about attracting the right audience to your website through relevant and helpful content. Potential customers find you through channels like blogs, search engines, and social media. The Inbound way helps your business adapt to the fast-changing needs – not just with your marketing, but with the entire customer experience. Inbound Marketing is about creating a flux of new prospects to your website, and converting them to customers. The four distinct phases (Attract, Convert, Close, Delight) turn strangers into visitors, leads, customers, and promoters of your product or service. The term "inbound marketing" was introduced by HubSpot’s CEO Brian Halligan. 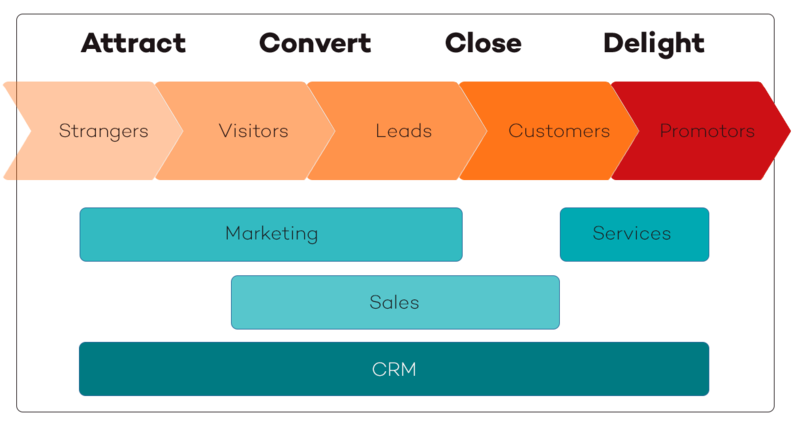 So why not have Brian (and co-founder Dharmesh) explain you how they define Inbound. HubSpot has been highly rated as a Leader in the Marketing Automation Quadrant for the last years by G2 Crowd. Our opinion? They're the best! Organize your contacts, get insights on your leads, and monitor your deals. For free. All-in-one marketing software to run full inbound marketing campaigns. Full set of sales tools. Close deals faster and boost productivity. Interact with customers, service them faster, get insights. With an HQ based in Belgium, we are an international team of highly trained and experienced specialists who have helped startups and enterprise companies across North America and Europe.